Bio Notes: David Monro Westland was christened in Dundee on 23 October 1845, the son of James Westland and his wife Agnes Monro. He was articled as a civil engineer to B & E Blyth in 1863 and remained with the firm when it became Blyth & Cunningham after Benjamin Hall Blyth's death in 1866. 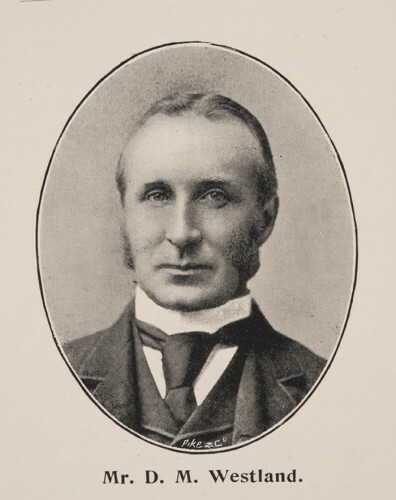 When Edward Blyth retired in 1886 to become a Scottish American investment manager George Miller Cunningham and Benjamin Hall Blyth junior took Westland into partnership, the practice title becoming Cunningham Blyth & Westland; and when Cunningham retired in 1893 it became Blyth & Westland. Although Westland's private address has yet to be established, it is known that he lived in a house designed for him by the architect John Watson. Westland retired in 1913. He was an extremely competent structural engineer as can be seen at the dome of the McEwan Hall for which he designed the ironwork. He died in Edinburgh on 14 March 1926 leaving moveable estate of £41,476 12s 4d.